With an office full of foodies, everyone has an opinion on the best place to eat around Bryant Park. Two BPC employees spent their lunch hour moonlighting as food connoisseurs to share their thoughts on one of many options around the park. Kati sums up the duo’s picnic in the park. Looking for fresh fast food in the Bryant Park area? If you work in midtown Manhattan, you are probably already well-versed in the Pret A Manger lore. This London import was practically made for park picnicking, so it’s no surprise that there are about five in the Bryant Park vicinity. Yesterday, with no threat of rain and a park full of Broadway stars, I headed out with coworker Catherine for a Prêt picnic in the Park. Catherine, a vegetarian, beelined for one of her favorites, the Spicy Falafel Melt. I too opted for a favorite, the Roast Beef and Arugula sandwich. Prêt makes two different sized sandwiches – the half size is perfect for mixing and matching, so I chose the Balsamic Chicken and Avocado Sandwich to complete the meal. At first bite, it’s all falafel. A few more, and you’re in a sea of spicy tomato sauce and red peppers. The ingredient list includes a “Mediterranean yogurt,” but I didn’t discover any until I’d almost devoured it. Too bad, because it was deliciously creamy and cut down the heat of the tomato sauce. The falafel fits in surprisingly well with the Italian flavor of peppered tomato. I couldn’t figure out why until I opened a falafel ball and found fennel inside; the small touch is delicious and brings the seemingly opposing flavors together into a warm, gooey, and (very) filling wrap. Good choice Catherine. I, on the other hand, was not completely satisfied with either of my choices. The Roast Beef was adequate – the acidity of the red onion and Dijon mustard, combined with the creaminess of the mayonnaise create excellent foils to the smoky roast beef, elevating this sandwich out of a ‘meat & potatoes’ category. That being said, I usually want roast beef to be rare - this meat had been cooked past any pink color. And what’s with all the arugula? A simple piece of lettuce would have sufficed, and not fallen out the sides of the sandwich. Worse was the Balsamic Chicken and Avocado Sandwich, a simple combination. Again – same complaint with the arugula. This balsamic chicken would be excellent in a salad, but as a sandwich, it’s lacking. One of the main tenets of Pret sandwich-ology must be that avocado is a condiment. I have to disagree, as this sandwich falls flat on its un-dressed bun. After tasting these halves alone, Catherine and I got creative. Chicken and Avocado… meet Roast Beef with Arugula. 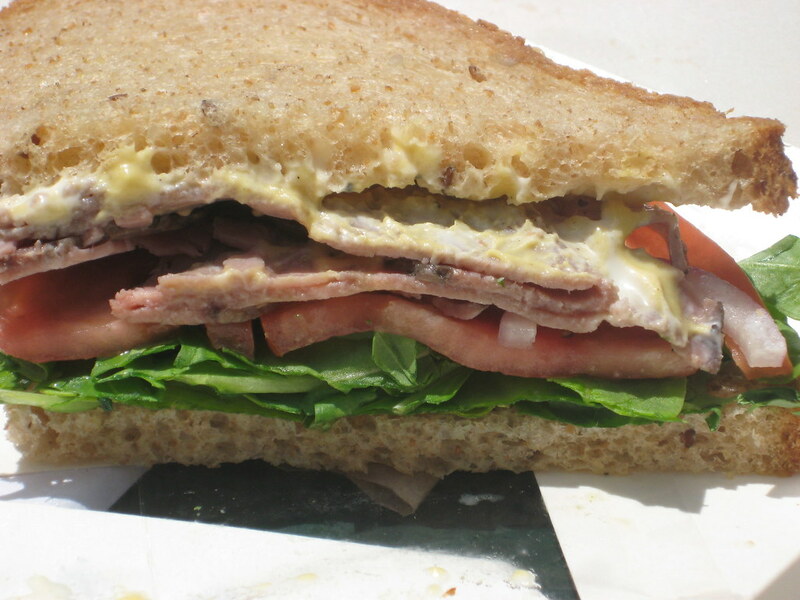 What we created may offend, but I have to assure you it was a match made in Bryant Park sandwich heaven. World, meet the nouveau club sandwich. With sandwiches priced under $10, you can afford their popcorn, too. Never before have three ingredients created such bliss. Yes, just three! Corn kernels, oil, and sea salt. Catherine says though she has these ingredients at home and both a stove-top and an air popper, she simply can’t create anything that rivals the white fluffy goodness that comes out of a Pret bag, despite dozens of attempts. Until she masters it, she vows to give Pret $1.50 for the privilege. All in all, Pret is not to be missed if you’re looking for a high quality lunch at affordable prices. Catherine and I may have come up 2 for 4 with our choices (unless you count our culinary creation), but Pret has dozens of sandwiches made from seasonally fresh and often organic ingredients. So if you don’t like it the first time, there are always more options. Stop at the Pret on 42nd Street between 5th and 6th to pick up lunch on your way to Bryant Park. Grab a table, pull up a chair, and unwrap your Pret box “ready to eat”.